Evidence from empirical data sets, Syst. Biol. 51: 509-523. Carter, A. M., 2001, Evolution of the placenta and fetal membranes seen in the light of molecular phylogenetics, Placenta 22: 800-807. Cartmill, M., and MacPhee, R. D. E., 1980, Tupaiid affinities: The evidence of the carotid arteries and cranial skeleton, in: Comparative Biology and Evolutionary Relationships of Tree Shrews, W. P. Luckett, ed., Plenum, New York, pp. 95-132. de Jong, W. W., van Dijk, M. A. M., Poux, C., Kappe, G., van Rheede, T., and Madsen, O., 2003, Indels in protein-coding sequences of Euarchontoglires constrain the rooting of the eutherian tree, Mol. Phylogenet. Evol. 28:328-340. Delsuc, F., Scally, M., Madsen, O., Stanhope, M. J., de Jong, W. W., Catzeflis, F. M. et al., 2002, Molecular phylogeny of living xenarthrans and the impact of character and taxon sampling on the placental tree rooting, Mol. Biol. Evol. 19: 1656-1671. Douady, C. J., Delsuc, F., Boucher, Y., Doolittle, W. F., and Douzery, E. J. P., 2003, Comparison of Bayesian and maximum likelihood bootstrap measures of phyloge-netic reliability, Mol. Biol. Evol. 20: 248-254. Efron, B., Halloran, E., and Holmes, S., 1996, Bootstrap confidence levels for phylo-genetic trees, Proc. Natl. Acad. Sci. USA 93: 13429-13434. Flynn, J. J., Parrish, J. M., Rakotosamimanana, B., Simpson, W. F., and Wyss, A. E., 1999, A Middle Jurassic mammal from Madagascar, Nature 401: 57-60. Goldman, N., Anderson, J. P., and Rodrigo, A. G., 2000, Likelihood-based tests of topologies in phylogenetics, Syst. Biol. 49: 652-670. Goodman, M., 1975, Protein sequence and immunological specificity: Their role in phylogenetic studies of Primates, in: Phylogeny of the Primates, W. P. Luckett and F. S. Szalay, eds., Plenum, New York, pp. 219-248. Gregory, W. K., 1910, The orders of mammals, Bull. Amer Mus. Nat. Hist. 27: 1-524. Haeckel, E., 1866, Generelle Morphologie der Organismen, Berlin. (Secondary citation from Gregory, 1910). Helgen, K. M., 2003, Major mammalian clades: A review under consideration of molecular and palaeontological evidence, Mammal. Biol. 68: 1-15. Hillis, D. M., and Bull, J. J., 1993, An empirical test of bootstrapping as a measure of assessing confidence in phylogenetic analysis, Syst. Biol. 42: 182-192. Hudelot, C., Gowri-Shankar, V., Jow, H., Rattray, M., and Higgs, P. G., 2003, RNA-based phylogenetic methods: Application to mammalian mitochondrial RNA sequences, Mol. Phylogenet. Evol. 28:241-252. Huelsenbeck, J. P., and Ronquist, F., 2001, MRBAYES: Bayesian inference of phylogenetic trees, Bioinformatics 17: 754-755. Huelsenbeck, J. P., Ronquist, F., Nielsen, R., and Bollback, J. P., 2001, Bayesian inference of phylogeny and its impact on evolutionary biology, Science 294: 2310-2314. Huelsenbeck, J. P., Larget, B., Miller, R. E., and Ronquist, F., 2002, Potential applications and pitfalls of Bayesian inference of phylogeny, Syst. Biol. 5: 673-688. Kielan-Jaworowska, Z.-K., Cifelli, R. L., and Luo, Z., 1998, Alleged Cretaceous placental from down under, Lethaia 31: 267-268. Kumar, S., and Hedges, S. B., 1998, A molecular timescale for vertebrate evolution, Nature 392: 917-920. Larget, B., and Simon, D., 1999, Markov chain Monte Carlo algorithms for the Bayesian analysis of phylogenetic trees, Mol. Biol. Evol. 16: 750-759. Lin, Y.-H., and Penny, D., 2001, Implications for bat evolution from two complete mitochondrial genomes, Mol. Biol. Evol. 18: 684-688. Lin, Y.-H., McLenachan, P. A., Gore, A. R., Phillips, M. J., Ota, R., Hendy, M. D. et al., 2002, Four new mitochondrial genomes and the increased stability of evolutionary trees of mammals from improved taxon sampling, Mol. Biol. Evol. 19: 2060-2070. Luckett, W. P., 1980, The use of reproductive and developmental features in assessing tupaiid affinities, in: Comparative Biology and Evolutionary Relationships of Tree Shrews, W. P. Luckett, ed., Plenum, New York, pp. 245-266. Luo, Z.-X., Cifelli, R. L., and Kielan-Jaworowska, Z., 2001, Dual origin of tri-bosphenic mammals, Nature 409: 53-57. Luo, Z.-X., Kielan-Jaworowska, Z., and Cifelli, R. L., 2002, In quest for a phylogeny of Mesozoic mammals, Acta Palaeontologica Polonica 47: 1-78. Madsen, O., Scally, M., Douady, C. J., Kao, D. J., DeBry, R. W., Adkins, R. et al., 2001, Parallel adaptive radiations in two major clades of placental mammals, Nature 409:610-614. Martin, R. D., 1990, Primate Origins and Evolution: A Phylogenetic Reconstruction, Princeton University Press, Princeton, NJ. Matthew W. D., 1915, Climate and evolution. Annals of the New York Academy of Sciences 24:171-318. Mau, B., Newton, M., and Larget, B., 1999, Bayesian phylogenetic inference via Markov chain Monte carlo methods, Biometrics 55: 1-12. McKenna, M. C., 1975, Toward a phylogenetic classification of the Mammalia, in: Phylogeny of the Primates, W. P. Luckett and F. S. Szalay, eds., Plenum, New York, pp. 21-46. McKenna, M. C., and Bell, S. K., 1997, Classification of Mammals Above the Species Level, Columbia University Press, New York. Murphy, W. J., Eizirik, E., Johnson, W. E., Zhang, Y. P., Ryder, O. A., and O'Brien, S. J., 2001a, Molecular phylogenetics and the origins of placental mammals, Nature 409:614-618. Murphy, W. J., Eizirik, W., O'Brien, S. J., Madsen, O., Scally, M., Douady, C. J. et al., 2001b, Resolution of the early placental mammal radiation using Bayesian phylogenetics, Science 294: 2348-2351. Murphy, W. J., Stanyon, R., and O'Brien, S. J., 2001c, Evolution of mammalian genome organization inferred from comparative gene mapping, Genome Biology 2(6): reviews0005.1-0005.8. Nikaido, M., Kawai, K., Harada, M., Tomita, S., Okada, N., and Hasegawa, M., 2001, Maximum likelihood analysis of the complete mitochondrial genomes of eutherians and a reevaluation of the phylogeny of bats and insectivores, J. Mol. Evol. 53: 508-516. Novacek, M. J., 1980, Cranioskeletal features in tupaiids and selected eutherians as phylogenetic evidence, in: Comparative Biology and Evolutionary Relationships of Tree Shrews, W. P. Luckett, ed., Plenum, New York, pp. 35-93. Novacek, M. J., 1990, Morphology, paleontology, and the higher clades of mammals, in: Current Mammalogy, H. H. Genoways, ed., vol. 2, pp. 507-543, Plenum, New York. Novacek, M. J., and Wyss, A. R., 1986, Higher-level relationships of the Recent eutherian orders: Morphological evidence, Cladistics 2: 257-287. Novacek, M. J., Wyss, A. R., and McKenna, M. C., 1988, The major groups of eutherian mammals, in: The Phylogeny and Classification of the Tetrapods, M. J. Benton, ed., vol. 2, pp. 31-71, Oxford University Press, London. Penny, D., Hasegawa, M., Waddell, P. J., and Hendy, M. D., 1999, Mammalian evolution: Timing and implications from using the logdeterminant transform for proteins of differing amino acid composition, Syst. Biol. 48: 76-93. Posada D., and Crandall, K. A., 1998, MODELTEST: testing the model of DNA substitution. Bioinformatics 14: 817-8. Poux, C., van Rheede, T., Madsen, O., and de Jong, W.W., 2002, Sequence gaps join mice and men: Phylogenetic evidence from deletions in two proteins, Mol. Biol. Evol. 19: 2035-2037. Rich, T. H., Vickers-Rich, P., Constantine, A., Flannery, T. F., Kool, L., and van Klaveren, N., 1997, A tribosphenic mammal from the Mesozoic of Australia, Science 278: 1438-1442. Rich, T. H., Flannery, T. F., and Vickers-Rich, P., 1998, Alleged Cretaceous placental from down under: Reply, Lethaia 31: 346-348. Rich, T. H., Vickers-Rich, P., Constantine, A., Flannery, T. F., Kool, L., and van Klaveren, N., 1999, Early Cretaceous mammals from Flat Rocks, Victoria, Australia, Rec. Queen Victoria Mus. 106: 1-29. Rich, T., H., Flannery, T. F., Trusler, P., Kool, L., van Klaveren, N., and Vickers-Rich, P., 2001, A second tribosphenic mammal from the Mesozoic of Australia, Rec. Queen Victoria Mus. 110: 1-10. Rich, T. H., Flannery, T. F., Trusler, P., Kool, L., van Klaveren, N., and Vickers-Rich, P., 2002, Evidence that monotremes and ausktribosphenids are not sistergroups, J. Vert. Paleont. 22: 466-469. Sargis, E., 2001, The phylogenetic relationships of archontan mammals: Postcranial evidence, J. Vert. Paleont. 21: 97A. Scally, M., Madsen, O., Douady, C. J., de Jong, W. W., Stanhope, M. J., and Springer, M. S., 2001, Molecular evidence for the major claddes of placental mammals. Journal of Mammalian Evolution. 8: 239-278. Shoshani, J., and McKenna, M. C., 1998, Higher taxonomic relationships among extant mammals based on morphology, with selected comparisons of results from molecular data, Mol. Phylogenet. Evol. 9: 572-584.
and its bearing on the 'dual origin' of Tribosphenida. C. R. Acad. Sci. Paris de la Terre et des planets 333: 141-147. Simmons, N. B., 1995, Bat relationships and the origin of flight, in: Ecology, Evolution and Behavior ofBats, P. A. Racey and S. M. Swift, eds., Symp. Zool. Soc. London, 67: 27-43. 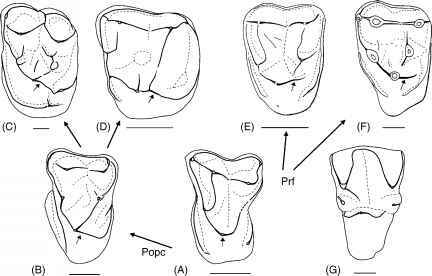 Simmons, N. B., and Quinn, T. H., 1994, Evolution of the digital tendon locking mechanism in bats and dermopterans: A phylogenetic perspective, J. Mammal. Evol. 2: 231-254. Simpson, G. G., 1945, The principles of classification and a classification of mammals, Bull. Amer. Mus. Nat. Hist. 85: 1-350. Springer, M. S., and de Jong, W. W., 2001, Phylogenetics: Which mammalian supertree to bark up? Science 291: 1709-1711. Springer, M. S., Murphy, W. J., Eizirik, E., and O'Brien, S. J., 2003, Placental mammal diversification and the Cretaceous-Tertiary boundary. Proc Natl Acad Sci U S A 100: 1056-61. Stanhope, M. J., Bailey, W. J., Czelusniak, J., Goodman, M., Si, J.-S., Nickerson, J. et al., 1993, A molecular view of primate supraordinal relationships from the analysis of both nucleotide and amino acid sequences, in: Primates and Their Relatives in Phylogenetic Perspective, R. D. E. MacPhee, ed., Plenum, New York, pp. 251-292. Suzuki, Y., Glazko, G. V., and Nei, M., 2002, Overcredibility of molecular phyloge-nies obtained by Bayesian phylogenetics, Proc. Natl. Acad. Sci. USA 99: 16138-16143. Swofford, D. L., 1998, PAUP*. Phylogenetic Analysis Using Parsimony (* and Other Methods), Version 4, Sinauer Associates, Sunderland, Massachusetts. Szalay, F. S., 1977, Phylogenetic relationships and a classification of the eutherian Mammalia, in: Major Patterns in Vertebrate Evolution, M. K. Hecht, P. C. Goody, and B. M. Hecht, eds., Plenum, New York, pp. 315-374. Szalay, F. S., and Drawhorn, G., 1980, Evolution and diversification of the Archonta in an arboreal milieu, in: Comparative Biology and Evolutionary Relationships of Tree Shrews, W. P. Luckett, ed., Plenum, New York, pp. 133-169. Szalay, F. S., and Lucas, S. G., 1993, Cranioskeletal morphology of archontans, and diagnoses of Chiroptera, Volitantia, and Archonta, in: Primates and Their Relatives in Phylogenetic Perspective, R. D. E. MacPhee, ed., Advances in primatology series, Plenum, New York, pp. 187-226. Swofford, D. L., 1998, PAUP*: Phylogenetic Analysis Using Parsimony (* and Other Methods), Version 4. Sinauer, Sunderland, MA. Waddell, P. J., Kishino, H., and Ota, R., 2001, A phylogenetic foundation for comparative mammalian genomics, Genome Inform. 12: 141-154. Waddell, P. J., Okada, N., and Hasegawa, M., 1999, Toward resolving the interordinal relationships of placental mammals, Syst. Biol. 48: 1-5. Whelan, S., Lio, P., and Goldman, N., 2001, Molecular phylogenetics: State-of-the-art methods for looking into the past, Trends Genet. 17: 262-272. Wible, J. R., and Covert, H. H., 1987, Primates: Cladistic diagnosis and relationships, J. Hum. Evol. 16: 1-22. Wible, J. R., and Novacek, M. J., 1988, Cranial evidence for the monophyletic origin of bats, Amer. Mus. Novit. 2911: 1-19. Wilcox, T. P., Zwickl, D. J., Heath, T. A., and Hillis, D. M., 2002, Phylogenetic relationships of the dwarf boas and a comparison of Bayesian and bootstrap measures of phylogenetic support, Mol. Phylogenet. Evol. 25: 361-371. Wiley, E. O., 1981, Phylogenetics: The Theory and Practice of Phylogenetic Systematics, Wiley, New York. Woodburne, M. O., Rich, T. A., and Springer, M. S., 2003, The evolution of tri-bospheny and the antiquity of mammalian clades, Mol. Phylogenet. Evol. 28:360-385.